This month for The Secret Recipe Club, I was assigned the blog Angel’s Homestead. On her site you will find a ton of information! Not only will you find some delicious, good old fashion home cookin’ type recipes you will also learn about meal planning as well as how to be more frugal. Also, as of the new year you will find many of her recipes are gluten-free which is a big plus for those of you out there who eat gluten-free. As I perused Angel’s Homestead, I found so many different recipes. Each month, it’s always so hard to pick from everyone’s tempting recipes. I decided I wanted to do something for breakfast. 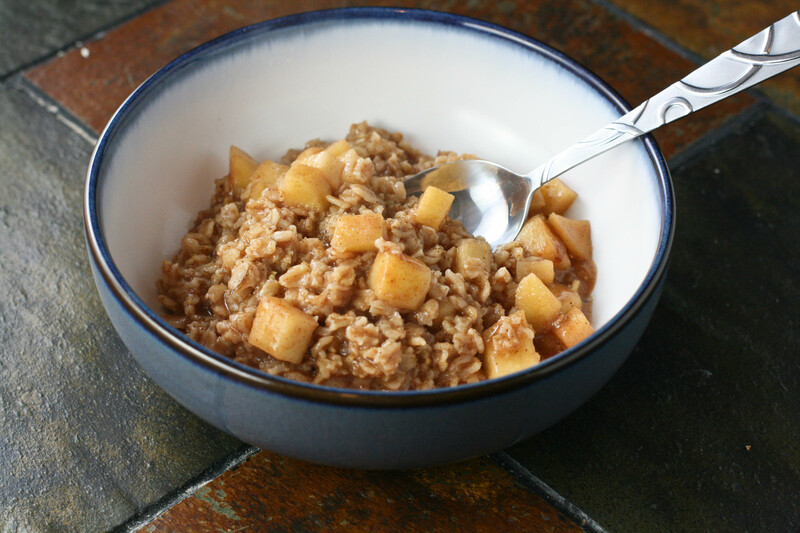 As I looked through the breakfast section on her blog, I came across “Apple Pie Oatmeal.” I love oatmeal on a chilly winter morning and I love apple pie just about any time so I decided that was the way to go. Although, I also was very tempted to make Pumpkin Pie Oatmeal. I think I just really like pie! This oatmeal truly was like eating apple pie for breakfast. All the flavors are there. The sweetness of a little brown sugar, the warmth of cinnamon and nutmeg, the slight tartness of apples all swimming together in this hearty oatmeal. It was thick, warm and left our bellies very full. I wasn’t sure the recipe would make very much but it was enough to feed 3 people a good, filling breakfast. – Combine the butter and sugar in a heavy saucepan over medium heat and cook for 2 minutes, stirring frequently, until melted and blended. – Add the apples, cinnamon, nutmeg and salt and cook for about 4 minutes, stirring, until the apples release their juices. – Add the oats and cook for about 2 more minutes, until the juices are absorbed, stirring to prevent sticking. – Add the apple juice and water and bring to a boil. Reduce the heat to a simmer, cover and cook for 7 to 10 minutes, until the oatmeal is thick and the apples are soft. – Let the cooked oatmeal rest, covered, for 2 minutes. Serve hot. Dessert in breakfast form? Well done. My husband would LOVE this recipe. I’m not big on apple pie – I know, such a weirdo, right? But he loves apple pie and he is such a finicky breakfast eater. Yum! Apple pie is one of my favorites! And eating it for breakfast would be amazing! It was definitely tasty indeed! This sounds amazing and so much healthier than the cinnamon apple instant that I usually use. It was way better than instant and really was still a quick breakfast too! Yum!! Apple pie oatmeal…now that will sure get me out of bed in the morning! Ooo! If you give it a try, let me know what you think. I thought it was so tasty and a great way to start the day. oo when we pick fresh apples we will have to give this a try.